This ticketed event will fill up fast! 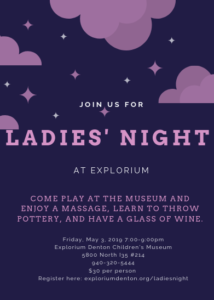 Come to Explorium and unwind with a drink, throw some pottery, and just hang out. We will also raffle off a stocked wine fridge! Bring cash or card to purchase raffle tickets on site. For tickets, register here. Come explore with us! Explorium is designed for kids 12 years and younger! Our purpose is to provide opportunities for children and their families to learn and play together. 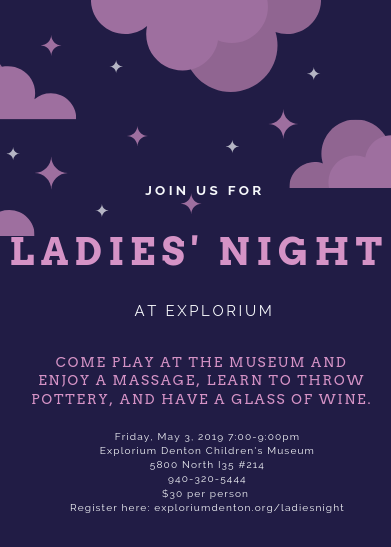 Explorium is a 501(c)(3) non-profit organization.